I received so many comments and questions about this jacket when I posted on SnapChat during fashion week, so I’m excited to finally share the details with you! You all know how much I love moto jackets, but sometimes I prefer something a little more elegant and feminine. 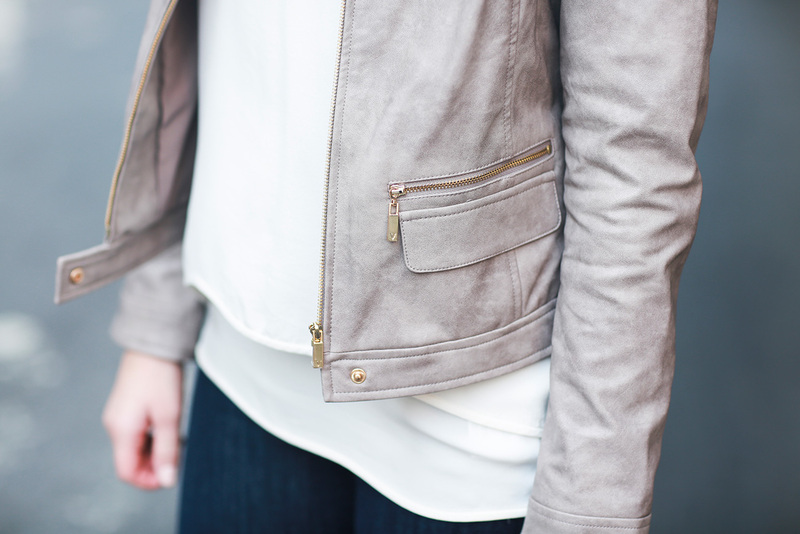 I recently purchased this soft grey faux leather jacket at Nordstrom and it’s been the perfect topper to wear with jeans! As I mentioned last week, I tend to get chilly in office buildings, on airplanes, and generally whenever I’m inside at my place. I like to keep the air conditioning low when I sleep so I can bundle up under the covers, but that leaves me chilly during the day while I sit at my computer! This jacket is sleek enough for the office, but it’s totally stylish and a great option for the weekend and travel too. I love the subtle shade of grey paired with gold hardware – it’s a little unexpected, but the combo is stunning! It’s not a super heavy leather, making it a great lightweight, transitional option for these next couple months. There’s also a matching skirt! Vince Camuto has a bunch of other gorgeous transitional pieces this season, like this jacquard LBD, this A-line denim miniskirt (also this faux suede style! ), and this sleeveless bow neck blouse. Also, this sweater isn’t transitional but I LOVE it. The lace trim is so pretty! This jacket it stunning, love the color. Now that is my kind of leather jacket! LOVE! 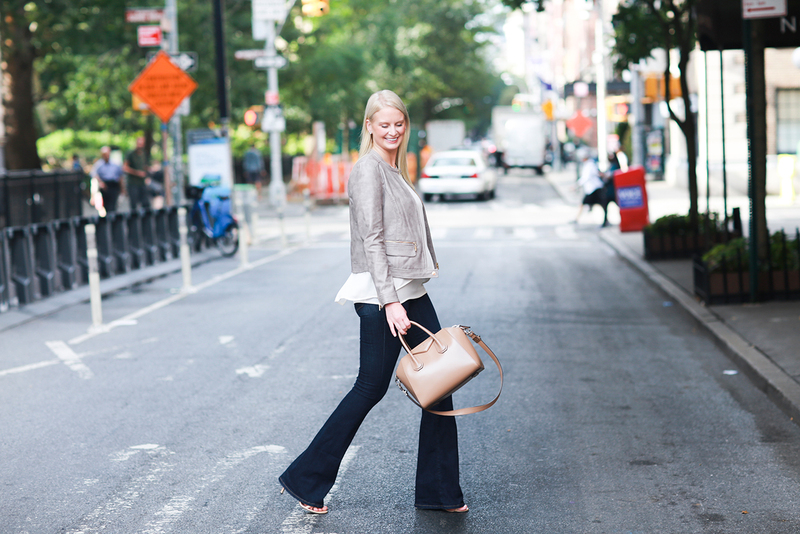 So chic, Merritt! Have a great Monday! This jacket is perfection!!! So polished and chic. It will go with everything season after season. A great investment piece! I love your leather jacket! Such a gorgeous shade of gray. I am love that leather jacket! The style is so cute and the color is the perfect shade of grey. How perfect for fall! Love that jacket. Love the color of the jacket! That jacket is gorgeous! What a perfect color! Really loving that jacket! Also love the feminine trouser jeans as well. OBSESSED with this look! I have been on the fence about how I feel about the flare jean comeback but they look amazing on you and I love how you styled them. Looking forward to more of your fall posts! Stunning as always. Love the colour of that leather jacket! 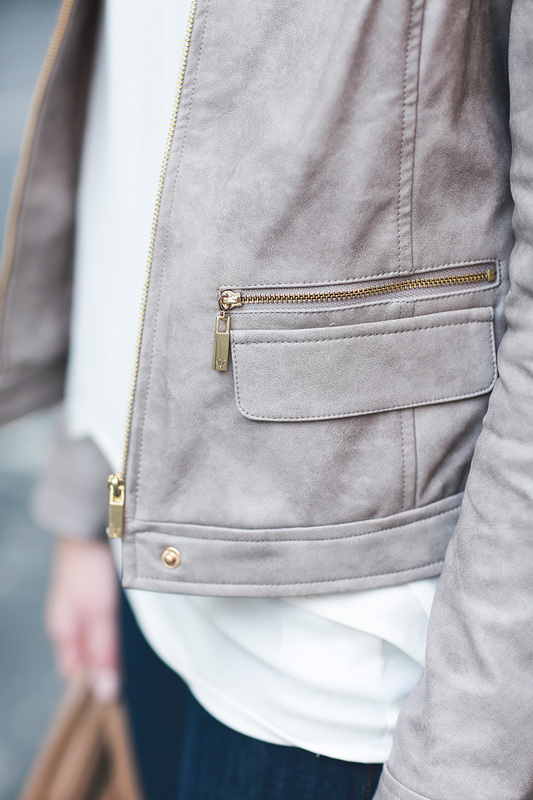 I love these layers, and that soft grey shade of the jacket is just to die for. This is such a cute outfit, girl! I love those sandals and how you’ve paired them with a leather jacket, adding a nice edgy finish to the look. Thanks for sharing and I hope you have a great day ahead! Leather are my dream and my most favorite are faux moto for girls and Flight Jackets of men.